December 2017 The lower part of London-based Jodie Carey’s installation Earthcasts is just about visible from Newman Street, through the parked cars and semireflections of Soho’s buildings on the gallery window. The pillars of plaster behind the glass immediately conjure a hint of nature. Once inside, one sees that the gallery space has been transformed into something akin to a copse of silver birch. Spread unevenly at intervals of anywhere between 50cm and 2m is an arrangement of 50 totemic casts, mottled white, which, while all explicitly constructed objects, are suggestive more of natural growth than the initial sombre impression given by their presence as unmoving, sentinel-like silhouettes. Each of the 50 casts stands around 3m tall, immersing but not oppressing the viewer. The rusted bases offer the kind of weighty physical presence that only a lump of metal can, which, in turn, amplifies the sense of a light fragility in the plaster trunks they sup-port. This physical contrast of plinth and cast extends to the metaphysical, pointing towards growth and decay. Which is natural and which is manmade, however, remains unclear. As one approaches the work, more intriguing aspects of the conversation with the environ-ment it inhabits become apparent: as a pool of light falls through the roof lantern at the back of the space, the copse breaks into something like a clearing. 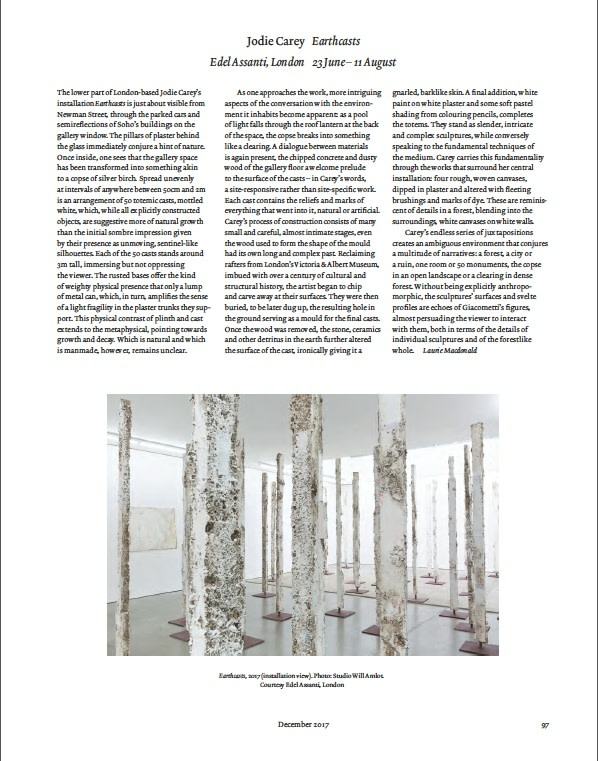 A dialogue between materials is again present, the chipped concrete and dusty wood of the gallery floor a welcome prelude to the surface of the casts – in Carey’s words, a site-responsive rather than site-specific work. Each cast contains the reliefs and marks of everything that went into it, natural or artificial. Carey’s process of construction consists of many small and careful, almost intimate stages, even the wood used to form the shape of the mould had its own long and complex past. Reclaiming rafters from London’s Victoria & Albert Museum, imbued with over a century of cultural and structural history, the artist began to chip and carve away at their surfaces. They were then buried, to be later dug up, the resulting hole in the ground serving as a mould for the final casts. Once the wood was removed, the stone, ceramics and other detritus in the earth further altered the surface of the cast, ironically giving it a gnarled, barklike skin. A final addition, white paint on white plaster and some soft pastel shading from colouring pencils, completes the totems. They stand as slender, intricate and complex sculptures, while conversely speaking to the fundamental techniques of the medium. Carey carries this fundamentality through the works that surround her central installation: four rough, woven canvases, dipped in plaster and altered with fleeting brushings and marks of dye. These are reminis-cent of details in a forest, blending into the surroundings, white canvases on white walls. Carey’s endless series of juxtapositions creates an ambiguous environment that conjures a multitude of narratives: a forest, a city or a ruin, one room or 50 monuments, the copse in an open landscape or a clearing in dense forest. Without being explicitly anthropo-morphic, the sculptures’ surfaces and svelte profiles are echoes of Giacometti’s figures, almost persuading the viewer to interact with them, both in terms of the details of individual sculptures and of the forestlike whole. Jodie Carey: Earthcasts on view through Friday September 1 at Edel Assanti.